It's been a little while since we've spotlighted our work on the blog -- which makes it the perfect time to tell you a little about Motown Memories, a fundraising event to benefit Rise & Shine (if you haven't heard of Rise & Shine, check out this post). We've done a number of projects for them in the past -- including a colorful anniversary campaign -- but our latest project has a whole different feel. Rise & Shine was looking for an upbeat design that would fit in with the colors and style of the Motown era. We started by putting together a moodboard to make sure we were evoking the right feel. After the Rise & Shine team signed off on the moodboard, we dove right in and designed a coordinating poster and e-vite. Take a peak at our work below, or give them a call at 828-883-2295, ext. 15 to purchase tickets to the event. Click to see the full e-blast! If you live in the Brevard or Asheville area we encourage you to attend Motown Memories and see what Rise & Shine is all about! Is your non-profit looking to build a relationship with a marketing firm? We'll be more than your marketing team -- we'll be your community partner. Working together, we can create the social content, graphic design, and marketing plan to help you increase your local reach. 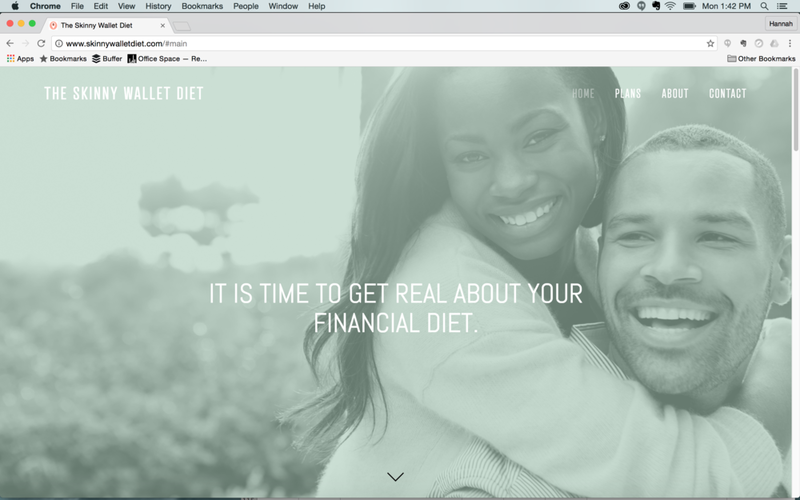 The Skinny Wallet Diet is financial planning for the average person. Most people don’t need a stockbroker or expensive financial advisor... they need to know how to start saving and spending responsibly. With 10 years of experience Mary Edwards is the perfect person to help you do that. That’s where we come in -- when Mary Edwards was looking for a new website to take The Skinny Wallet Diet to the next level we were ready to jump into action. Most of the Skinny Wallet Diet’s clients are female -- so we knew we could pull in some fun, girly colors. We started with different shades of pinks and toned them down to keep them from looking goofy (this is finance after all). 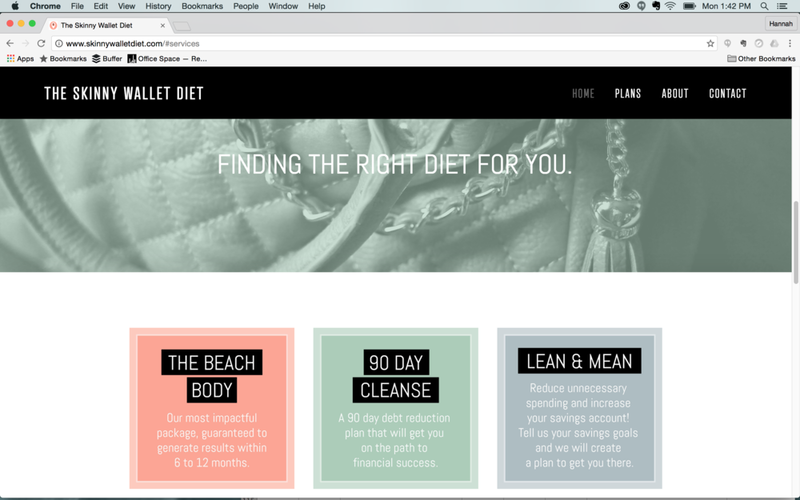 As The Skinny Wallet continues to develop we wanted to set Mary up with a site that would draw potential clients in, but would also be easy to update in the future. Our favorite thing about this site is the unconventional color scheme -- it's the perfect blend of serious and creative. 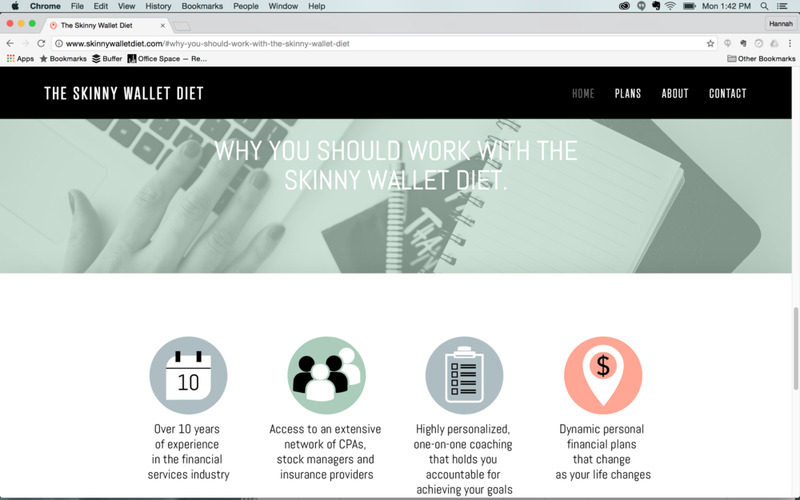 We can't wait to see The Skinny Wallet use their new website continue to grow! Want a regular little dose of the Skinny Wallet? Follow their brand new account on Twitter at @theskinnywallet. We know, we know -- we’ve highlighted Rise & Shine before… but when your clients just keep doing great work, it never gets old showing it off. Throughout 2016, Rise & Shine has been hosting a series of events to celebrate and raise awareness for their organization. An afterschool program with a mission of promoting racial justice and equality, we loved being able to collaborate on collateral that's helping drive their mission forward. All of our work for Rise & Shine features bright colors, eye-catching layouts, and vibrant photography of the program participants. We work to keep the focus on the facts and figures that demonstrate the program's efficacy, as well as highlight the organization's values. Take a look at the colorful collateral below! Below, starting clockwise at top left: One-page infographic (front + back), homepage web slider, event program, Facebook graphics, and bookmark. Working with non-profits is a passion of ours, and we're always eager to dive into a new partnership. If your organization's marketing needs a boost, don't hesitate to reach out to us! When a great organization does great things, there's nothing better than being a part of it. Our previous client, Rise & Shine, recently reached out as they prepared to celebrate their 20th Anniversary -- and we couldn't wait to be get involved. Rise & Shine, an afterschool program committed to promoting racial justice and equality, was looking for a fun and energetic logo to represent their 20 Years campaign. You may remember one of our previous projects for Rise & Shine -- a timeless print piece that would appeal to a wide variety of audiences. We'll be posting flyer designs + bookmarks + ads + more when the project is complete -- but for now keep an eye on Rise & Shine's Facebook page to stay in the loop on their 20-year anniversary celebration. When we were approached by Tawney Weir, the creative force behind Little Toro Designs, we were immediately inspired by her southwestern flair. This owner + maker + designer was looking for a place to not only showcase her product, but also Little Toro's modern desert aesthetic. As a business owner, there's nothing better than working with someone who is equally passionate about their craft. After our first short conversation, it was clear that Tawney's work was both inspired and sustained by the unique blend of cultures around her. Click the image to see the site live! Who Little Toro Is: Metalsmith jewelry handcrafted in Tucson, AZ. Inspired by the nature and culture of the southwestern desert. What They Needed: A clean + modern website that embodies Little Toro's desert chic style without distracting from the product. What We Delivered: A customized Squarespace site with e-commerce capabilities. By highlighting Little Toro's beautiful editorial photography (by Puspa Lohmeyer Photography) we were able to not only keep the product front and center, but also capture the essence of the brand. The takeaway? When inspired editorial photography meets clean web design, e-commerce magic happens. If you feel like your website could use a refresh, get in touch -- we'd love to do a free assessment of your current website! Reclaimed Lumber and Beams is a fun client to work with because, quite frankly, I want to personally purchase almost everything they sell. Partnering with this business on social & design projects means looking through photo after photo of gorgeous, hand-crafted wooden furniture and home installations. Today's Client Spotlight is a look at the warm, visual social presence we've created for RLB. Who They Are: A North Carolina-based business with a big national footprint, integrating reclaimed wood/antique lumber from the Appalachian mountains into residential and commercial construction (think: everything from rustic mantles, doors and tables to barnwood siding and flooring). What They Needed: RLB draws clients from all over the U.S., so they needed social that could reach wide and convert to sales, while still maintaining a personal, small-business feel. What We Delivered: The Reclaimed Lumber and Beams Facebook page is warm, conversational, and heavy on photography -- giving potential customers a glimpse of the wide variety of projects RLB could create for their home, office, or venue. Q&As and behind-the-scenes content keep followers engaged, and links drive them back to the RLB website. This is retail, but it's not big-box -- projects are personalized and driven by the customer. Glimpses of previous projects get those ideas moving for soon-to-be clients. The takeaway? Every business has a personality, and its social presence should match up with it. A cool, detached tone works for some businesses, but that's not the personality RLB needed to project online. What personality are you cultivating for your business or organization on social media? If you have questions, I'd love to talk. I've mentioned our work for Revolution Mill, a historic redevelopment site in Greensboro offering office and event space, a restaurant and (soon) residential. Here's a look at the print and web collateral we created for Creating Community Week, a series of events aimed at sharing the vision of Revolution Mill with the public. The design needed some visual and textual continuity, which is why we developed the seal-style logo you see here. A consistent (but not rigid) color scheme of red and teal adds to the continuity between each piece. The look here is consistent but not uniform, as the audience for each event varied -- from residents of the surrounding neighborhood to creatives/ad agencies to CEOs and community officials. Let us know what you think! We'll be back tomorrow with a few links to end the week. While I spend a lot of time working on branding (and accompanying collateral) for businesses, nonprofits, and other organizations, I also really enjoy developing branding, logos, resumes and websites for individuals. This week's Client Spotlight (a first for the Hue & Tone blog!) shows what we created for Meghan, a young professional whose career transition required a branding about-face. Who She Is: A twenty-something working in journalism -- and searching for a role outside that field. What She Needed: The resume Meghan had been using was colorful, bold, and nontraditional. It worked just fine in her creative field, but was too much for many of the companies and organizations on her "to apply" list. She needed something that was clean and conservative -- without looking like a resume template. What We Delivered: Meghan's new resume features muted colors, clean typefaces, and simple lines. The result is a look that's appropriate for any industry, while still standing out from the rest of the stack. I'm happy to report that it helped her land her dream job in government. The takeaway? It's easy to think, especially if you work in a creative industry, that colors and branding in general are off-limits. That's not the case. Making strategic decisions about branding, informed by your knowledge of the industry you're targeting, will help you achieve your career goals. I've seen it happen time and time again! What decisions have you made about your personal brand? Does it serve your goals & purpose? If you're not sure, let's connect. Things are moving quickly here at Hue & Tone, and I’ll have updates on a few new projects to share soon! For now, I thought I’d share a few of my favorite projects from the past. Laura, the owner of an accessories-based boutique startup, came to me wanting branding (web and print) that matched her stylish, edgy aesthetic. The project gave me a chance to wade into a little bit of everything, from an Etsy-integrated website to print collateral. We wove all of that together with a colorful, geometric design that was cohesive, appealing, and fun. I LOVE creating resumes and other personal branding materials for clients. It’s an opportunity to get to know someone and figure out how to communicate their strengths; plus, every industry is different so the design options vary. I’ve done bright, punchy colors for an actress; neat, modular blocks for a PR rep, clean and simple for an architect, and a little of everything else, too. Creating this ten-minute documentary on sustainability and 21st-century marketing was the best opportunity. It gave me the chance to edit, assign, build a story and really summarize a complicated issue in a fast-paced, visually appealing way. I love projects that allow me use my skills in communication to create a compelling message. We just completed the design of this evergreen one page for Rise & Shine, an afterschool program committed to promoting racial justice and equality. This was an especially fun project for us, because we love working with small non-profits to find creative, cost effective solutions. Our goal here was to create a print piece that would be timeless and appeal to a wide variety of audiences.